New Delhi, Dec 4: The National Green Tribunal on Monday pulled up the Delhi government for its "lackadaisical" approach over rising pollution levels in the city, a day after bad air quality plaguing the capital for several weeks interrupted play during the ongoing Test match between India and Sri Lanka at the Feroz Shah Kotla stadium here. The tribunal chairperson, Justice Swatanter Kumar, in his sharp remarks rapped the authorities for allowing the match in the city despite bad air quality. "Every newspaper has been carrying headline that the air pollution was going to be higher this week. Still, you took no action. Even the players were playing the match wearing masks. You should not have held the match if the air quality was so bad. Are people of Delhi supposed to bear this?" Kumar said. Kumar lashed out at the government for not filing a comprehensive action plan on how to battle the rising air pollution despite the green court's specific order on November 28, asking the authorities in Delhi, Punjab, Haryana, Uttar Pradesh and Rajasthan to submit their proposals on curbing bad air quality. The governments in Uttar Pradesh, Haryana and Rajasthan have already filed their action plans with the tribunal. The Delhi government sought more time on the contention that its Chief Secretary and environment secretary were recently changed and the new officers needed to settle down to finalize the plan. But the court apparently was not impressed with the reason. "Where is your action plan? Why have you not submitted it? What can we do if you keep on changing everybody? It's not our problem if people don't want to stick to you. "You keep on doing meetings but tell us a single action or a step you have taken in the last four days to combat air pollution," the court said. The court said that the government was adopting a "lackadaisical" approach in dealing with the situation even as pollution had crossed alarming levels in the city and directed it to file the report by Wednesday. Referring to the India-Sri Lanka Test match, which was stalled on Sunday after Lankans were said to have complained to match officials that they felt like vomiting due to poor air quality, the court said: "Look at people abandoning (the) match." 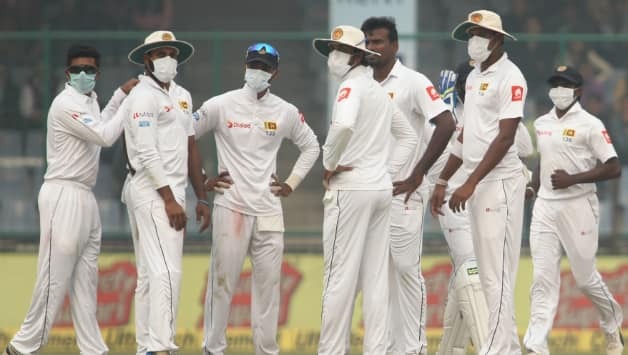 The visitors on Sunday wore face masks to combat smog pollution amid disruption in the third Test against India. Sri Lanka coach Nic Pothas said his players had to come off the field after they felt like vomiting. The play, however, continued uninterrupted on Monday even as indicators showed pollution levels rising to "hazardous" levels. The overall air quality index in the capital was 375 - considered to be "very poor" and hazardous to health. The tribunal also pulled up the Delhi government for not introducing odd-even car rationing scheme at this point in time when the air quality was severe. "You want exemptions for two-wheelers but you don't apply your mind that these 60 lakh vehicles cause the maximum pollution," the court said.